Just over a year ago, I’d never have imagined I would be living in a foreign country. 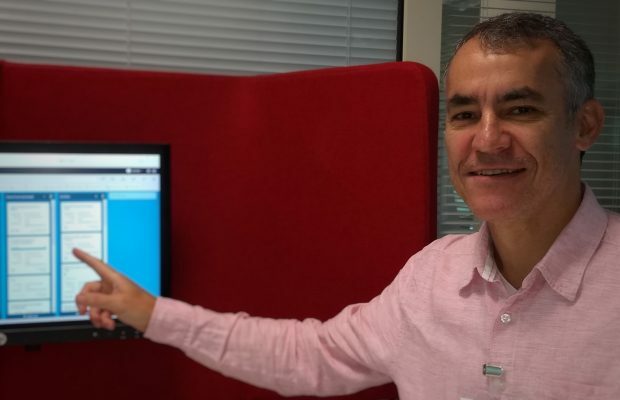 I’d only ever lived outside of my home country, Brazil, for a couple of weeks – but when I saw the vacancies in DWP Digital, looking for somebody with my experience and background I decided to apply. And here I am, working as a lead portfolio manager in our Newcastle hub. It’s been a big change, not least because of the different culture here in the UK, its people, the weather and driving on the UK roads! Of course, I miss Brazil. I mostly miss the food! The special black beans also known as Feijoada and a good churrasco (barbecue). Generally, I’ve found that people in the UK like spicy food which I’m not used to. There are so many differences work wise. The shell is the same, but the detail is interesting to note. For example, people here work 37 hours a week whilst in Brazil, it’s general nearer to 48 hours. However, it feels more productive because the 37 hours are better used. I quite like the UK productivity because it seems a healthier work-life balance, people work hard, but also get to have a good amount of personal time. The huge transformation of services DWP is involved in is amazing and I’m very proud to be a part of it. I guess the best part of a transformation is imagining how the future will look. It’s evolving at a rapid speed and I can barely imagine what it was like before the transformation began. Although with advances in technology it’s an ongoing process and I don’t think we can look to a time when we are ‘transformed’ as we’ll always have something new and innovative to welcome in. The best part of working here has been the people. Everyone around me is embracing the transformation journey, willing to hear new ideas and opportunities, willing to support and contribute, willing to make it happen, and willing to embrace this exciting new environment. My role is to look across the totality of our projects and help the organisation understand the full picture of our portfolio to deliver our main objectives. We are promoting a shift in mind-set within the portfolio management community to be more focused on proactivity and becoming enablers. We’re doing this by moving to preventative measures, rather than just being reactive or purely reporting. Primarily we’re making closed connections with the delivery organisation. In addition, we’ve set some dynamic dashboards to highlight the critical projects. All the projects report in alignment with the projects’ sprints on a fortnightly basis, and this is setting the foundation for a more insightful overall view. And, within the portfolio practice we’re ensuring our competencies reflect the organisational objectives so that we are joined up as one seamless team. My advice for people who are not from the UK but thinking about applying for our vacancies, is to go for it. You’ll be impressed by how we’re transforming the way projects are delivered in DWP Digital and the people that are making this digital transformation happen. We’re recruiting portfolio managers now. If you’re interested in working with us, take a look at our current vacancies. You can also have a look at our LinkedIn page, and find out more about what’s happening in DWP Digital by subscribing to this blog and following us on Twitter @DWPDigital and @DWPDigitalJobs.